Raccoons Rags: New outfits for Patience and Ellowyne Wilde. Needed to sew! Sew, sew, nothing but sew, for the last week or... sew. I've made some new outfits for Patience, and added some pretties to a lovely dress I've had for Ell sitting in my stock box for some time now. These are all up for grabs in my Etsy store. First up, a cute little number for Patience. As featured in the cute raccoon photo I've done, with the filter. 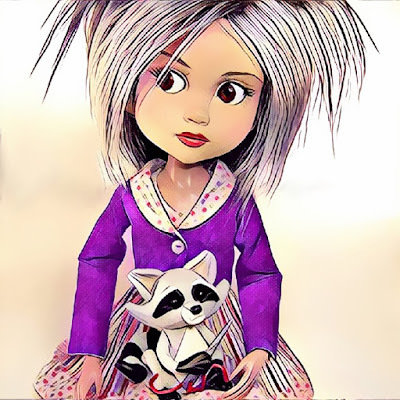 Here's the artwork - not my own drawing, just a filtered photograph, with the lovely raccoon from The Enchanted Cupboard. Just thought I'd throw it in here. It's been doing the rounds on my Facebook page. And next Patience outfit, This one with more frills and fripperies, and a little flannelette coat. And a little outfit I've had in the stock box for aaages. It seems sad to keep it there when it could go to a good home. I love dungarees, and keep meaning to make some more for Patience. Finally this gorgeous little puff-sleeve dress, used for one of my sewing patterns.... so it's sort of famous. Sort of. I added bloomers (love bloomers) and a sweet little hat. It's possibly a little too summery for the time of year, but then I'm terrible at making the appropriate things for the appropriate seasons. It's still a cute outfit for Ellowyne. As always, everything is sewn entirely by hand, and made with love and attention to detail. Now. What to do next? I want to get a new thing for Evangeline made... but I also want to make something for Gracie. I have discovered a JID leotard I made a long time ago fits Gracie quite well, so I have a few patterns already that won't take much adapting. But I'll probably end up doing the Evangeline thing. As it will nag at me if I get on with Gracie's stuff. Lovely outfits - you can never have too much purple!! I wish I could find some deep purple brushed cotton - I'll keep on looking! The Ell dress is rightly famous it was on your first Ell pattern the one that got me sewing again and I've a feeling it was the dress that introduced me to the delights of Liberty Tana Lawn... Good luck with deciding what to do next!!! I know! Considering I like purple so much, I have surprisingly little purple stash. I feel a spending spree coming on.... (JK) Brushed cotton in purple would be luscious. If I ever find some, I'll send you the link. That's right! It was my first ever Ellowyne pattern. I had to go check my catalogue because I'd forgotten. Well, I'm glad you got back into sewing, but feel slightly guilty that I've probably made you spend oodles on tana lawn..lol. I have a large amount of purple in all my stashes... funny that... I blame Donny Osmond... Don't feel guilty... I only buy what I can afford so if I couldn't afford it I wouldn't buy it and I've always loved Liberty fabric - I just didn't know it was called Tana Lawn lol!! Would a micro fleece work for the Ell coat - I've found some of that in purple!! I often dye a load of different fabrics to get a colour that I can mix and match, so I may do a purple/lilac load soon. Yes, it's all Donny's fault, lol. I wonder about micro fleece too actually. If it's fine and soft, it could work. I'm not sure if it would stretch though. Yup, the lining. Although some of the lining is in other fabrics found in the dresses. :) Lining Pip stuff is a veritable nightmare! Even with very fine fabrics like voile. I do like those wigs with the bunches. They take some making! Fur fabric is hard to sew, as the thread gets caught up in the pile all the time.